There was a phase, when having just a skeletal Network was enough, but today; the rapid explosion of traffic convergence (voice, video and data) within the network environment has created an overwhelming demand for professionally Installed Structured Cabling system for guaranteed throughput. Unfortunately, one of the areas often overlooked when increasing the numbers of network devices and application is whether the existing cabling infrastructure is designed to support higher bandwidth requirement and increased data speed, this has been responsible for most network performance issues. 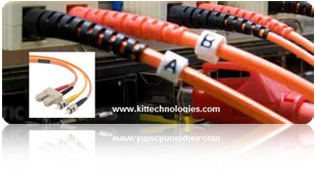 KITS technologies cabling team has the skill, experience and recourses to design, Install, test and manage your Cabling infrastructure (Fiber Optics & Copper) as well your Data center infrastructure to industry standard. Our engineers are highly trained and certified to prepare your Network for the future. All infrastructural projects deployed by us conform to industry standards and are covered by 25-year guarantee.